Helping dogs and cats that just can’t stand having a mani-pedi. Why do they hate it? This week I have had am influx of pets that just can’t stand having their nails clipped. For some pets it’s mainly the restraint that they hate, for others it’s the noise of the clippers and some just can’t stand having their feet touched. Dogs and cats feet contain large numbers of touch sensitive receptors and so are much more sensitive to being held than either yours or mine. 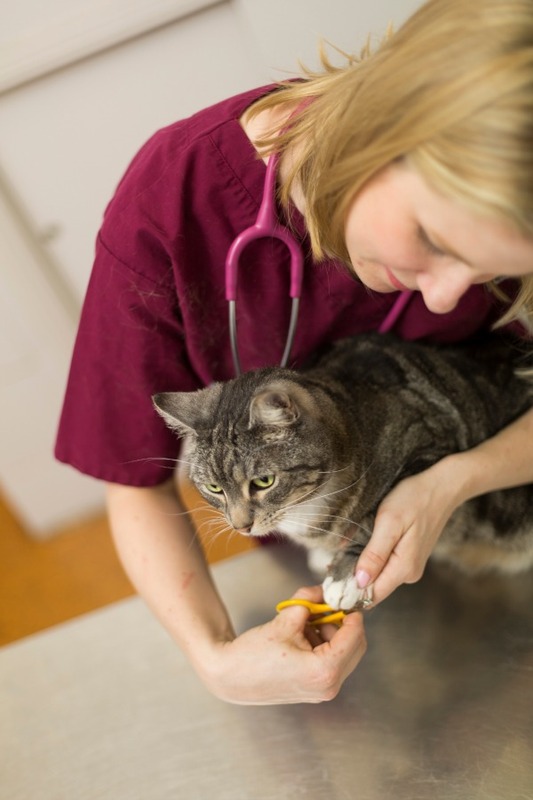 No matter what the cause of the anxiety around having nails clipped, animals that don’t allow it to be done are a cause of stress for themselves, vets, nurses, groomers and their owners! They can develop medical issues associated with nails growing into their feet and often the problem worsens each time we try and overpower them to allow clipping. Dr Sophia Yin was a huge inspiration to Dr Julie and sadly passed away earlier this month. She will be sadly missed by the profession but her memory and techniques will live on. Exactly the same technique can be employed with cats. Some canned food, tuna, Vegemite or peanut butter smeared on a spoon is a good option for them to lick while you practice holding their feet. What about puppies and kittens? Now for the prevention part! It is very important when you get a new puppy that you get them used to you handling them everywhere – opening up their mouth, looking in and handling their ears, and handling their feet. You can practice holding them and clipping small pieces from their toenails as soon as you get them! If you are having problems with a furry friend misbehaving for their mani pedi and would like some advice on what to do next then please contact Dr Julie at Life on Four Legs.